The blocked up Queensgate faceade which will be opened up onto St John's Square by Turtle Bay. Turtle Bay, the Caribbean-themed restaurant chain, is all set to bring life to St John’s Square in Peterborough city centre. 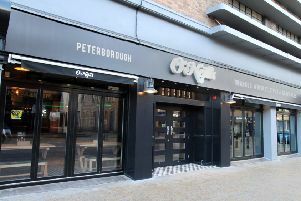 The growing chain, only launched in 2010, now boasts more than 20 restaurants including outlets in Leicester, Nottingham and Birmingham. Although the deal has not been finalised, Turtle Bay has applied for a licence for the huge new restaurant being created in part of the former H&M store in Queensgate. Once complete it will open out onto the St John’s Square. The news comes in the same week the Charles Wells brewery unveiled its plans for the former Clarkes restaurant, just yards away on Queen Street, which was vacated at the turn of the year. Thatwill become a Pizza, Pots and Pints concept pub. Turtle Bay was founded by Ajith Jayawickrema, who previously launched the Las Iguanas chain. Behind the bar you are likely to find more than 40 rums sourced from across the Caribbean, perfect for sipping and cocktails. A spokeswoman for the company could not confirm or deny an impending opening in the city, but Turtle Bay UK is currently advertising to recruit a “passionate and experienced” general manager for a new opening in Peterborough as well as applying to the city council for a drinks licence.